It took more than 100 hours of research and testing—conducted by an airborne-particle physicist and former NOAA scientist using $100,000-plus of equipment—to find the best air purifier. Most people are best off with the Coway AP-1512HH Mighty. But we also have an upgrade for faster filtering, and another recommendation for removing chemicals and odors. This post was done in partnership with Sweethome, a buyer’s guide to the best homewares. This is a condensed version of The Best Air Purifier; read the full review here. Before you jump in, know that effective air purifiers are expensive to both purchase and operate. You should invest only if you’re having respiratory symptoms (from allergies, asthma, or otherwise) that cleaner air could alleviate. Even then, it’s more effective (and cheaper) to avoid dirtying the air in the first place as opposed to cleaning it after the fact. Simple changes, like not smoking indoors and vacuuming regularly, could be sufficient to alleviate most symptoms. And despite the prolific marketing to the contrary, scientific studies do not support claims that air purifiers improve your health. (We cover this in greater detail in the What is purified air anyway? and Who should buy this? sections of the full review.) Granted, we were not in a position to perform health studies, but we were able to evaluate the air purifiers’ effectiveness at removing particulate matter and odors. The instruments we used to test these machines are capable of detecting particles as small as 0.010 micron, which is far below the threshold for civilian equipment and below the 0.3 micron threshold for the HEPA standard. We also conducted a first-of-its-kind odor-control test using a VOC meter. The downside to all this comprehensive testing is that it gives you a whole lot of information to parse. What follows is just a summary of our findings, but for those who are interested in learning more, the How we tested section of our full review includes our procedures, methods, and results, complete with tables and graphs of our results. The $250 Coway AP-1512HH Mighty earns our pick for being an overachiever in every regard. If you’re primarily concerned about common particle allergens such as pollen, mold, or dander, the Coway offers the best value compared with the competition. 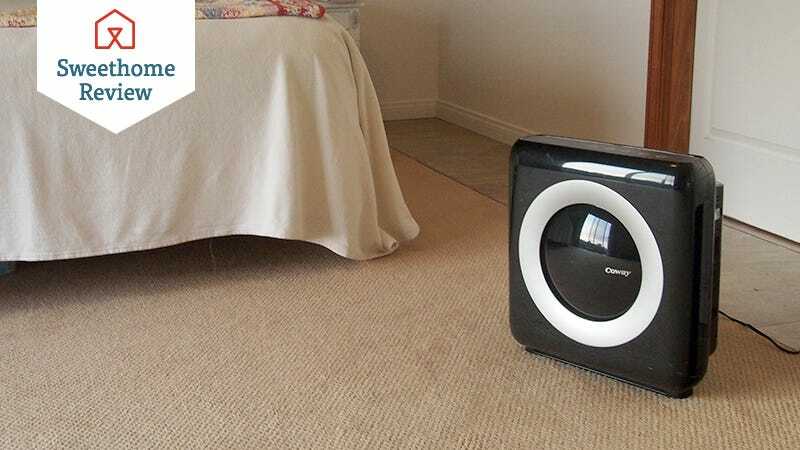 Despite its relatively low price and small size, our testing found this true HEPA unit was just as effective at removing particulate contamination from a bedroom-sized area as larger, more expensive purifiers costing two to four times as much. In fact, thanks to its quiet, brushless motor, it actually outperformed some of the high-end models in the short run because it can run at a higher fan setting while keeping noise levels down. If you turn it on when you enter a bedroom or a home office, it will remove virtually all airborne particles within a half hour and keep it that way until you turn it off. In addition to its strong performance, it’s actually the cheapest to own over a five-year period out of all the models we tested (about $560). It was also easily the smallest and lightest unit tested at 17 inches wide by 10 inches deep by 19 inches high, with a weight of 13 pounds. That means you can move it to wherever it’s needed and put it in a discreet location. Not that you need to hide it—Coway actually took the time to give it a decently attractive design, a rarity in the world of air purifiers. The Coway is excellent at removing particles, but its biggest flaw is that it is ineffective at removing odors (though that’s true across the board for purifiers in this price range). The thin 3/16-inch activated carbon filter is just not up to the task. It’s simply there as a prefilter for larger particles; our tests showed it was too lightweight to handle odor removal. If you have severe allergies to particulate allergens or other health issues related to air quality, or you’re willing to pay a premium for a machine that can be extremely efficient while running quietly, we recommend our upgrade pick, the Blueair 503 with the SmokeStop filter package. It uses an electrostatic charging process that allows more air to flow through the filter while creating less noise—that means you can run it at higher speeds without filling your entire home with the whir of a fan. In our noise-limited tests, it removed more than 90 percent of the particles from our bedroom-sized testing area in 10 minutes—that’s over 10 percent more than the next best purifier and over 60 percent more effective than the control. This makes it a good choice for areas where you might expect lots of air to exchange (e.g., any room that includes a high-traffic door or a window to the outside). Meanwhile, the SmokeStop filter’s 4.2 pounds of activated charcoal reduces odors and some potentially harmful gases almost as well as the far more expensive IQAir HealthPro Plus, but costing about $109 less per year to operate (including filter replacement and electricity cost estimates). Though the Coway is great at removing particles, it does very little to reduce odors (though that’s the same across the board for air purifiers costing less than $400). The Blueair, with its charcoal packet, fares a bit better. However, if you live in a problematic environment with microscopic chemical pollutants—say, near a freeway, non-organic farm, chemical/power plant, or refinery—or are particularly sensitive to odors and/or other volatile organic compounds like formaldehyde, we recommend the $530 Austin Air HealthMate Standard HM-400. It gets loud when you run it at settings needed to get a decent filtration rate (medium or higher), but no other purifier came close in our VOC test. In our tests for odor removal, the HealthMate’s 15 lbs. of activated carbon bested all other air purifiers by a wide margin. (For reference, the Coway doesn’t even have a quarter pound of activated carbon.) Its exceptional performance in this area is a big part of why FEMA and the Red Cross chose Austin Air units for deployment at Ground Zero and the surrounding areas in the aftermath of 9/11. The HealthMate’s annual operating cost of about $283 also makes it by far the cheapest high-end purifier to run. This is due to a filter that’s designed for you to replace it every five years instead of annually. It’s worth noting that when running the fan at comfortable sound levels, the Austin Air was less efficient than all other models at removing particles from the environment. But a little extra background noise isn’t too much to ask if serious health concerns involving pollutants are an issue. These picks may have been updated. To see the current recommendations, please read Sweethome’s guides.